Breathe easy in our private salt room. 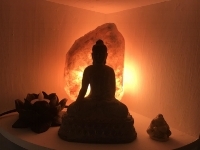 Salt therapy, or halo therapy, is a holistic approach to decreasing inflammation throughout the body, affecting mainly the respiratory (lungs and airways) and integumentary(skin and superficial glands) systems. Additional benefits from smoother, deeper breaths are stress reduction, improved digestion, increase lymphatic circulation- aiding in immunity, regulating heart rate and blood pressure, clarity of mind and much more.